DESCRIPTION: Chicago has been identified with the Great Books movement ever since Robert Hutchins and Mortimer Adler shook up the Midway in the 1930s. Three contemporary writers will assess where the movement has been, how it has changed, and where it’s going. Participants include Alex Beam, Boston Globe columnist and author of the forthcoming book A Great Idea at the Time: The Rise, Fall, and Curious Afterlife of the Great Books; Eva Brann, former dean and the longest-serving tutor at St. John’s College, Annapolis, known for its distinctive Great Books curriculum; and Earl Shorris, contributing editor to Harper’s and the author of numerous books, including Riches for the Poor: The Clemente Course in the Humanities. The session will be chaired by Daniel Born, editor of the Great Books Foundation’s quarterly magazine, The Common Review. Eva Brann was born to a German-Jewish family in Berlin. She emigrated in 1941 to the USA and received her B.A. from Brooklyn College in 1950, her M.A. in classics from Yale University in 1951, and her Ph.D. in archaeology from Yale in 1956. She also holds an Honorary Doctorate from Middlebury College. Vermont. She obtained a faculty position at St. John's College in Annapolis, Maryland, in 1957, and in her early years there was very close to her colleague, the philosopher Jacob Klein. After Prof. Klein's death, Prof. Brann increasingly assumed his role as the defining figure of St. John's College and the Great Books program. She is the longest-serving member of the faculty and previously served as dean of the college. 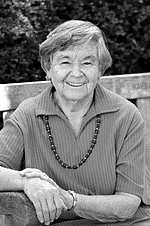 Eva Brann is currently considered a "single author." If one or more works are by a distinct, homonymous authors, go ahead and split the author. Eva Brann is composed of 3 names. You can examine and separate out names.